Colour digital printing, photocopies, business cards, brochures, and much more. 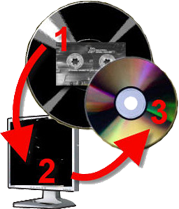 VHS & camcorder tapes to DVD, duplications, international video transfers, and more. Mailbox rentals, public fax services, cheques + deposit books, and much more. Your independent agent for 11 courier services, packaging services, same day to Toronto, and more.